German forces invade Denmark and Norway. The Germans embark on their sweep through the Low Countries (Luxembourg, Belgium, and the Netherlands) to invade France, violating the neutrality of these three states in the process, and taking everybody by surprise, which is the key ingredient of their blitzkrieg. The new French Minister of Defense is Paul Reynaud. He succeeds Edouard Daladier. The French yank Maxime Weygand out of retirement. 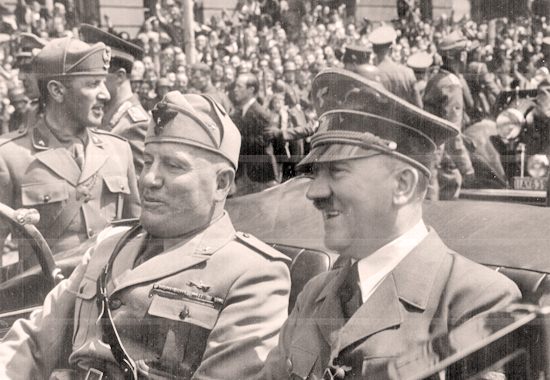 Nut Adolf and his buddy Benito Mussolini cruise through town in their convertible. See picture above. Maxime Weygand advises the French government to capitulate. The Germans enter Paris, France. Maxime Weygand, by now a 73 year old veteran, becomes French ministre de la défense nationale. Charles de Gaulle, who had fled to London because of his disagreement with French Marshall Petain's armistice with Germany, gave his The Flame of the French Resistance BBC radio address. Charles Huntziger becomes French ministre des armées.